Whip Hand Cosmetics is a makeup company based in Detroit. I don't want to call them Indie, because they're not exactly an Indie company BUT they're not mainstream like Urban Decay either. They're up there in ranks with Sugarpill Cosmetics. Hopefully one day We'll see WHC in Sephora or Ulta. 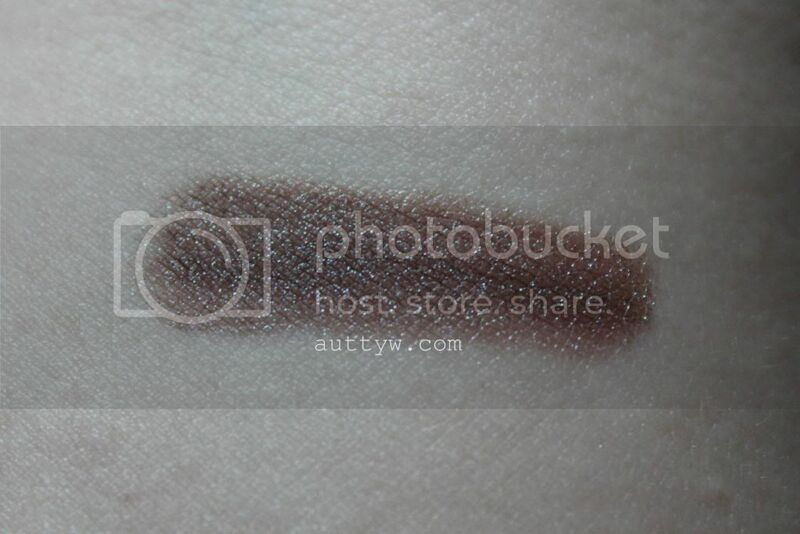 The Pure Pigment Loose Eyeshadow I decided to try out was Rocket. This is an eyeshadow that I've been wanting to try since I was introduced to them via Beauty Army. 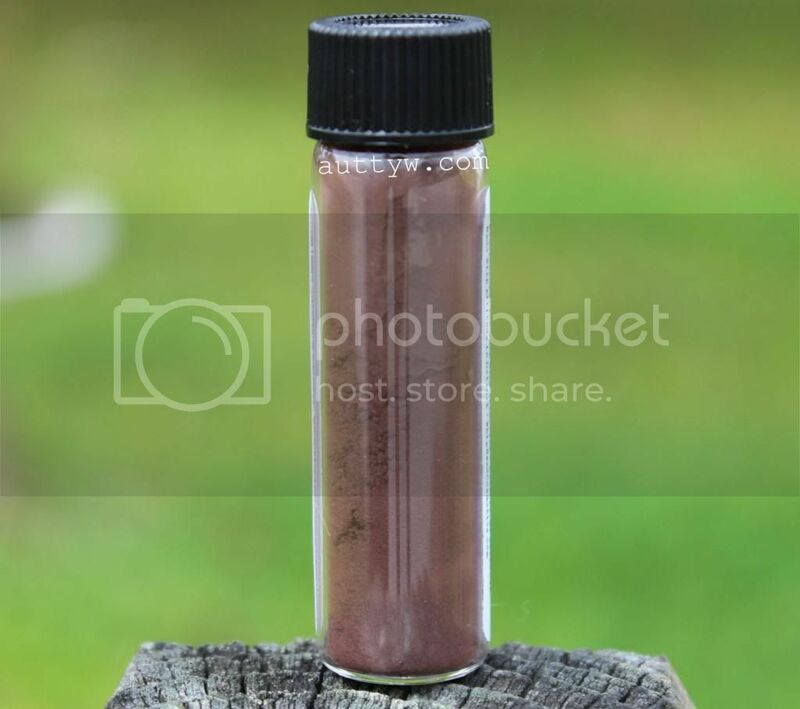 Rocket is a taupe/brown that has a blue duo-chrome shift to it. You may look at the packaging and go "ugh that looks like a pain in the bleep to use! ", it's actually not. The opening it quite a lot bigger than it looks, which is nice. I don't use giant eye shadow brushes, so this is perfect for me. You can decant them into a different jar if you so with though! 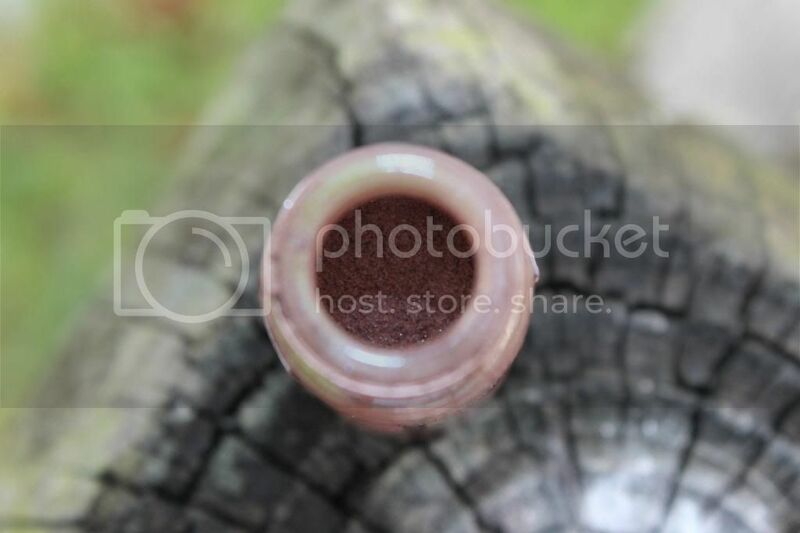 Whip Hand Cosmetics (or they spell is Cosmetiques now), houses their pigments in glass vials. The glass itself it pretty thick considering so I don't think there is any kind of worry in it breaking, unless it fall onto a hard surface. I'm sure you're all dying to see a swatch right?! Let me state this now I did not use a primer under this shadow, the only reason you would need a primer is to make it last all night or if you have oily lids. 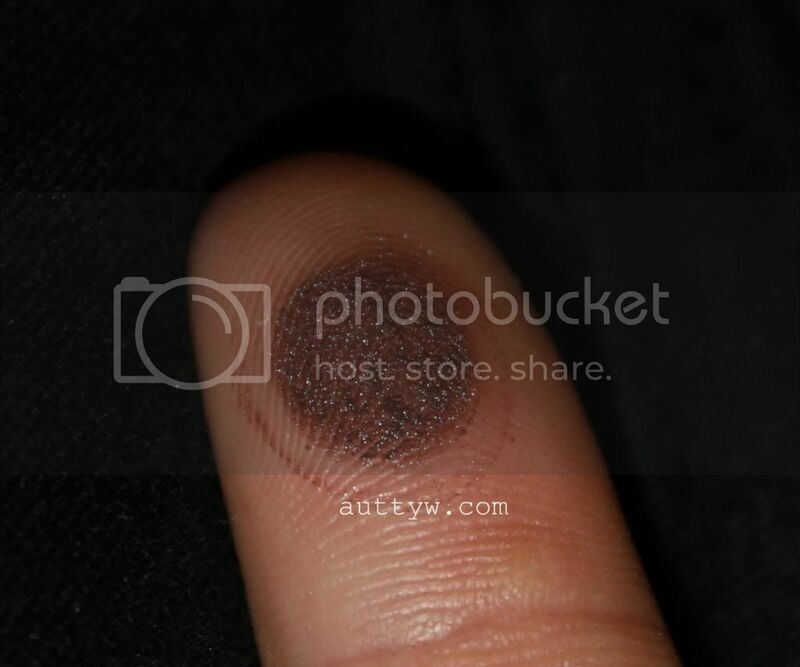 I show you a picture of it on my finger because I want you to see how much there was when I swatched it. As you can tell, there isn't much, I just tipped the jar and tapped off the excess. I definitely plan on getting more of their pigments and well, their creme shadows as well because they're all really gorgeous! 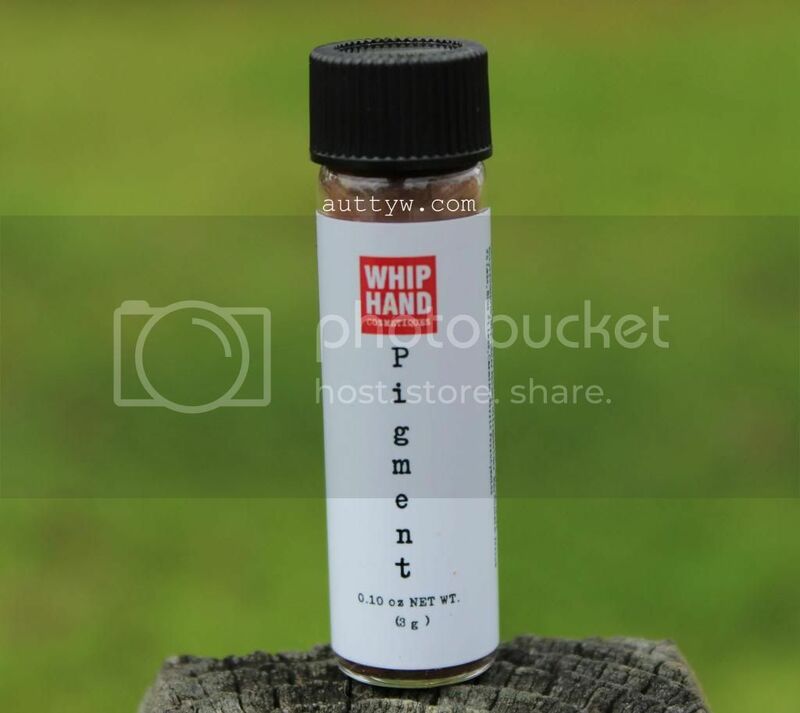 I HIGHLY recommend Whip Hand Cosmetics to anyone and everyone who is wanting good products. Not only that but you're supporting a "smaller" brand and keeping them in business! Rocket retails for $14 and you get 3g of product. Disclaimer: I received Rocket as a press sample via Whip Hand Cosmetics. I am not not being paid for this review. All opinions are my OWN. My only compensation is being allowed to keep the product. What a gorgeous shade with incredible color payoff! Yeah, I'm not sure about the packaging since I use larger brushes & I'm pretty clumsy where I'd probably knock it over too, haha. But it is unique! I like the packaging because it's compact and right now I don't have a lot of room, so small packages like this work perfectly for me. For those who use a bigger brushes then I do, would definitely not like this. I've been using it a lot and have to post some eye looks that I've used! Since I've a small space right now, the packaging works perfectly for me. I tend to use smaller brushes so I don't mind. I'll probably wind up decanting it into one of the containers I have because I'll be paranoid about it breaking. I've already dropped it when I was photographing it! D: I THOUGHT half of it fell out considering it fell OPEN and it fell upside down with it pouring out but barely any came out! So woah. I'm clumsy too!! I've dropped pigments before bahahah. Gorgeous shade! The color payoff looks fantastic! It really is! I was surprised on the color payoff to be honest! I've had such crap luck with eyeshadows lately. Very pretty! Packaging is a little strange but not necessarily bad. It's definitely handy if you're shot on space! Omg. I'm so glad that I am not the only one who does that! I've been doing my makeup WITHOUT the use of a brush lately because I've yet to wash mine. Bahha.